It’s Friday afternoon, the weekend is upon us and the hours are now ticking down rapidly to Sunday afternoon at MacHale Park and all that. Part of me holds firmly to the view that a clash of such importance so early in the year is utterly bonkers but, then again, that pretty much sums up the current creaking championship structure. No more than carping about whatever ref is assigned to matches involving us, however, muttering about how daft it is to be pitched into a championship contest with such high stakes at this juncture doesn’t do any good. We just have to get on with it. But this game shouldn’t, of course be seen as some kind of imposition. 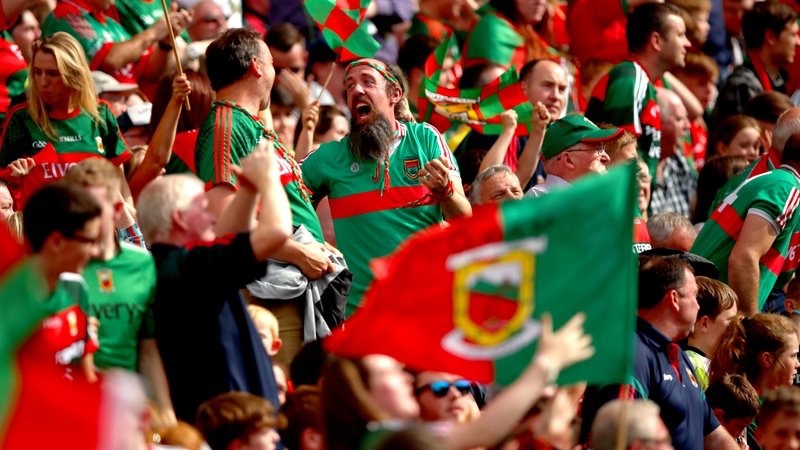 It’s Mayo/Galway in the championship, MacHale Park is going to be packed – for the first time in a long while – and both counties will want to emerge from the battle as top dogs. Can’t wait. Ahead of then, though, there’s other action involving the county, which is what this post is meant to be about. May as well get to the point, then. The Juniors were, of course, playing last night when they got the better of defending champions Leitrim by 0-17 to 0-8 in the Connacht JFC semi-final at Páirc Seán Mac Diarmada. 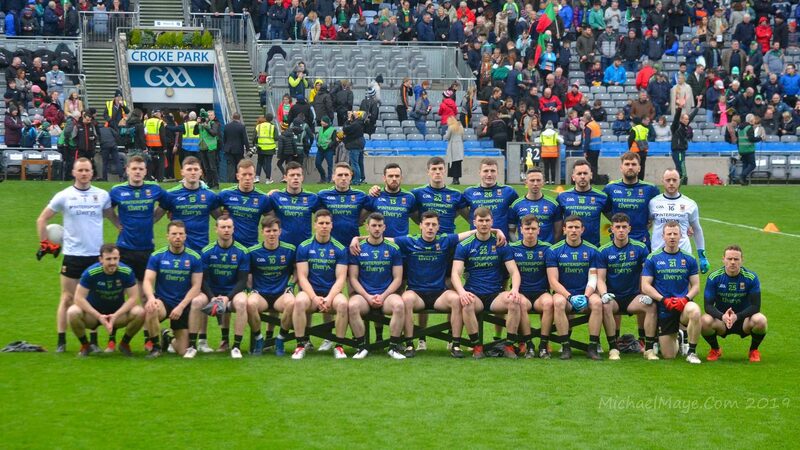 Here are match reports from both sides of the fence on that one – Mike Finnerty for the Mayo News, John Connolly for the Leitrim Observer. Jarlath Trench’s side now face Galway in the final on Sunday, a match that provides the curtain-raiser at MacHale Park. Galway, like ourselves at senior level in 1950, were ushered directly into the provincial decider without having to kick a ball at all (Sligo withdrew this week due to a bereavement in their camp). The JFC final throws in on Sunday at 1.30pm so those of you planning to get in early – as I am too, though perhaps not that early – will have the chance to test out the vocal chords ahead of the big one. You don’t have to wait until Sunday, though, for championship action involving the county. This evening sees the county’s U17s (should we term them thus or just call them Minors now?) play their second match in this year’s Connacht championship when they face Roscommon at Kiltoom (throw-in 7pm). We beat Leitrim handily in our opening game last week while the young Rossies took a bit of a tanking at the hands of Galway last Friday. The hurlers, meanwhile, begin their Christy Ring campaign tomorrow afternoon, with a tough assignment away to Wicklow. The Ring Cup now has a round-robin format as well this year and this Group 1 match throws in at Aughrim at 3pm tomorrow. Best of luck to all the Mayo teams in action over the coming few days. Finally, if you haven’t yet signed up for the championship mini-league there’s still time to do so – full details are here. A couple of things stood out for me. 1. Galway had Cluxtons kick outs deciphered . I don’t know what the data say but I think they did better on this than any other team recently . 4. To me this looked like Galway were peaking. To be like that at this time of year was both impressive and left me wondering , can they stay at this level ? 5. My instincts say no. It is all too reminiscent of Kerry last year in the league though it was three full months later before Kerry peaked albeit still way too early . This weekend’s game is only 6 weeks out from that league final and although I hope I’m not fooling myself I believe they will be somewhat off that sharpness / intensity. On the other hand if we can reach our All Ireland Quarter final replay 2017 intensity or close to it I think we will have the advantage there. There were multiple good goal efforts by Dublin and though Galway have good forwards they were unable to create many (? Any ) realistic goal opportunities . Cluxton didn’t feature in other words. I think Sunday should be similar . Their goalie needs to be tested , tested , tested. High balls will definitely cause confusion in there. Their own kick outs can be flaky so we have to be sharp for those opportunities . There are goals to be had here. The key forward and key man for us I believe will be Kevin McLoughlin. He is the best link player in the country ( and it’s a crime he hasn’t been recognized for this with an All Star)Both delivering early incisive and penetrating passes and being a dandy side stepper on wet and slippery pitches where he can go on runs will be key and could be decisive. Verdict : Galway a handful. Mayo to win . Roscommon are 0-9 to 0-5 up at half-time. Blow-by-blow updates are available on usual Twitter feeds. Minors being hammered at the moment.Something very wrong at under age level. A 13 point beating. Not good at any level. This has been going on too long now at under age level. Something has to change. Looks like our woes at underage is continuing with our minors getting well beaten by Roscommon- who in turn were well beaten by Galway. Yet another year where we are a distant third in Connaught. Expect the same to happen with the u20 team. There really is a crisis at underage level. Your right Jay, something was wrong with Mayo underage. However it’s not the fault of the current management set up, they inherited 5 years of neglect and mismanagement. These current crop of lads are a testament to their clubs and family that they’ve managed to reach any level at all given the cack handed, underfunded system they’ve come through. Morley has taken over the whole underage structure from U-14 up and deserves time to get the house in order. Give him a year or two and you’ll see the results. The trend at minor level is very worrying. Going to be impossible to make a Connacht final now because Galway have thrashed Roscommon and Sligo in the last week. Wow. Same old story . Only a matter of time now before this hits the top grade . Too many years of this rubbish , it’s not acceptable for Mayo to get beat at underage in the province for this long , it’s a shambles. Something has gone wrong. Hard to understand.mayo colleges have won five Connaught titles two all Irelands and two runners up in the last two years,yet our minors are heading for an all time low. As long as we continue to appoint coaches in our county based on a patronage system where you give the job as a reward for loyalty over all else then we’re going to continue to struggle. Not one sports science degree in the coaching set up. Our county coaching and administration are analog dinosaurs in a digital age. Vision, energy and professionalism matter little when the over riding qualifications are being a good “club man” and someone who “won’t rock the boat” when it comes to electing officers to the county board. Tomás Morley applied for the U17 role in 2017 and didn’t get the job despite putting in the exact same package that got him the job in 2018. If this feeds through to senior level we could be playing division three or four football in five to ten years. I hope Mike Solan can turn around the u20s and give us some hope. Attended tonight game in Kiltoom. Mayo lucky it was just 13 point margin, destroyed in midfield struggled for any scores from play and best player was the keeper Connolly who stopped the Rossies from scoring at least another 3 goals with outstanding saves. The biggest fear is we could go the way of Meath, Cork or even Derry. That’s the kind of thing that happens if you take the eye off the conveyor belt. Worrying times at underage level indeed! An underlying issue is rural depopulation and falling playing numbers in Mayo in general due to education and job opportunities etc. The clubs need to step up to the mark big style and we need to devise a new system to make sure we keep our best talent in the county. It’s futile copying the Dublin system because the landcape is completely different. This has to be bespoke to Mayo only. The problem is – do we have the coaching talent and the visionaries in the county to make this work? The future of Mayo football depends on it. Oh Jesus what happened the Minors against Roscommon.Are we going to get a repeat of the 70s of Mayo football in the the coming 20s. I read Tomas Morleys article on how he prepared the Minor team this year on the Mayo news and it seemed like it was professional setup in how he prepared his squad so I don’t think its anything to do with the Management. I think serious questions have to be asked at what is happening in Mayo underage at club level are club coaches getting the proper coaching why are we not producing quality players in the last few years.It not just losing we are getting hammerings at this level the last 4 years.We need to start investing in more fu?l time coaches, I think we only have 2 covering the 3rd largest county in Ireland and we are talking about winning All Irelands. Mayo county board should invest more money in the A colleges like Colmans, Geralds ,Muredachs ,Rice college and Ballinrobe who provide the Mayo panels with most players. Encourage current and former Mayo footballers in the Teaching profession to coach these teams, or bring in coaches from outside. Clubs like Ballina, Castlebar, Westport , and Claremorris should also be helped with coaching and facilities because these are the biggest populated areas in the County and the better the chance of getting that top footballer from these town clubs.Maybe small rural clubs should amalgamate to provide a higher standard of football for younger players too. How exactly are the clubs supppsed to step up Liam? A senior club in the county has to hand over between €17k-€21k in levies, insurance and registration before a cent is spent on the running of the club. Instead of the CB stepping up to the mark and employing a full time commercial director they take the easy option and let the clubs provide the money. The four divisions in the county could each have their own full time coach if the county board removed the yokes around their necks of the clubs that is the levy. I’m sure Roscommon suffers from rural depopulation too, and we have twice their population .Also many of the lads from recent minor teams are starring for their clubs at the moment,so it has to be the under age system that’s at fault. My comment was not intended as a criticism of clubs Liam. What I should have said was that the county board need to step up big time to do more to assist clubs in developing players as our clubs are where players learn their trade. I’m no admin guru – just another worried passionate fan so those costs you refer to is very revealing. I just hope something is done before this starts to impact on our senior team. Mayo and Donegal were the only counties to experience a fall in population since the last census Jay but I take your point. Perhaps we could learn something from what Roscommon is doing with their underage structure? Rural depopulation is as bad in Kerry as Mayo – yet they have won the last 4 minor all-Ireland’s and dominated the colleges A competition. There has to be a serious question mark about the standard of coaching at both club and county level. I think this is the start of the problem. I know in Kerry there are good people at club level willing to put their hands up – do the coaching courses – get qualified and raise the standard at underage club level. Underage county development squads down there are littered with good ex county players who have huge respect for these pkayers. To top it all they are after opening their centre of excellence in the last month – 4 sand based pitches, 2 flodlight, a state of the art gym, physio rooms etc. Its not rocket science. We are not within an asses roar of this. Our current senior team have helped to cover up huge problems that were ignored. I hear there are good coaches in some Mayo Secondary School, St Colman’s College Claremorris have a good teacher taking the Senior team this past few years. It seems to me that since the 2013 All Ireland minor win that things have fallen apart at this level, the cause must be the inept managers and coaches appointed this past 3 years. The talent is obviously there, Colman’s, Ballinrobe and West Port have reached the top level in the Schools competitions, I think this is U18.5 years, this was the case back in my days. The U21 game v Galway in Tuam last year served as a warning to me, Mayo were totally outclassed particularly in midfield, but Mayo persisted in kicking the ball straight to this area, I was sitting in the stand in disbelief, management had no clue what to do, no plan B. The last thing we need now South Mayo Exile is another white elephant sucking every available cent in the county into it. For the love of god and money can we not invest in coaching. We’re still paying for the stand and will be for another 20 years. We were within weeks of signing for some land to build a centre of excellence outside Balla until this years heavy rain did our due diligence for us and pointed out that the ground floods constantly. I’m amazed we didn’t buy it anyway. Kerry can build a centre of excellence because they can fundraise properly, they go to America and come home with a half a million dollars, we go with a biscuit tin. We don’t need another vanity project for the county board that’ll saddle the county with another generation of debt. They can build a CoE when they become financially independent of the clubs and appoint a commercial director who will do a proper financial assessment of the viability of the project. While this result is poor, it’s not a surprise to many posters here who highlighted the criminal neglect of our underage the last 5 years. I’ve faith in Tomás Morley and Liam Moffat, they deserve time to implement their structures. The legacy problem may take 2/3 years to put right though and that means a few more of these results in the coming years. If this was a gradual decline you might blame things like investment and coaching,but this has been a sudden and total collapse .We went from winning and challenging for all Ireland’s in 2013/14 to a record defeat in 2015. Beaten by 13pts by a team that was beaten by 22pts by Galway….Oh sweet Jesus ! Not sure top loading the big urban centres to the detriment of rural clubs the answer Chris. Think Ballina struggled to have 15 A side minor team last year. And rarely feature in North Mayo minor titles never mind county in good few years, think they even contested North Mayo B instead of A couple years ago and lost to kilcommon (stand to be corrected here). Bellmullet and Knockmore despite population and rural nature doing alright. Bellmullet especially given depopulation. Be inclined to think funding clubs and maybe the smaller ones more so may pay more dividends. The larger urban centres with population should be able fund themselves if get house in order. Castlebar westport with 3 teams in some age groups…. At underage may be of use for lower divisions e.g. 5 and 6 to go to 11 a side competitions. This would ease pressure on clubs to amalgamate and hassle that comes with it, give them chance to be competitive, and for clubs that have decent numbers but not enough for to field 2 teams but to many for one team and all lads get game time a chance to feed a second team and be competitive. Selection process for squads needs IMO to move from trials to actually scouting games. Lads develop at different rates. Others won’t go to trials for various reasons including lack of self belief and not wanting to appear big headed by going to trials etc. Is the club minor league in Mayo still 11 a side,? this was the case in my days. One thing I see creeping into the Gaa here in Dublin is parents coaching and in alot of cases are the lead mentors, but those parents never played the game, I know of one or two South Mayo clubs that have this issue also. Can anybody from Mayo tell me about the GPO system in Mayo, ie, in Dublin every club has one some large clubs have two, those Games Promotion Officers are full time paid staff, they organise events like Coaching the Coaches, they go into the National Schools in the club catchment area and help coach the kids, mainly 3rd and 4th classes. When it comes to coaching I am old fashioned, where a person can only teach what they know, hence played the game. Typical comments tonight from those who were not at the game and in some cases look forward to Mayo losing so the finger can be firmly pointed by those who know better. The last few years have been disastrous in terms of both coaching & development and results. Slowly (and very slowly) this tide is turning. There is a professionalism about this group that will hopefully continue but again, very few see or want to see that. Everything was great last week after a win against a poor Leitrim team and now everything is terrible after a heavy defeat to a good Rossie team. It will be interesting to see how this develops over the next 6 weeks as Mayo will run into a Galway team in top form. Im a Rossie just before i start. Mayo have won 2 All Irelands at underage(I know the same team basically) in the last 5 years. Most county’s would be more than happy with that i know we would. So writing the death of Mayo in years to come is a bit premature. Our u17s who who tonight im not sure how good they are they had am excellent win tonight but just because we were slathered by Galway last week dont base that on how far behond galway ye may be at this age group. After 30 minute last week we were 5 points each against galway conceded two goals in injury time and as young last heads went 2nd half and were embarrassed after we aremt as bad as scoreline against galway suggested. Very good point Oliver. Worth remembering that minor is now U17. That extra Year makes a big difference in kids. if you look at under 16 results say v minor (u18) at club level games can become very one sided very quickly at U16 when heads drop. Same 2 teams 2 years later can be lot closer as the mental steel that comes with experience and maturity kicks in. I attended Jarlaths for 5 years. In that period they won 2 all Irelands and lost another final. I don’t believe, in fact I know, none of the players lifted a weight in their time playing for the team. 4 evenings a week they trained with some running and football practise for the 4 evenings. They weren’t trained by some guru manager. They were trained by a priest who had an interest in football. They ate the same grub I ate and there were no special provision made as regards football preparation except for train, train and train again. They had football pitches and a place to shower after. I don’t understand, or am I missing something ?why all this cash is needed for some great centre of excellence. Jarlaths never had any huge centre of excellence. They had good footballers and besides that they had pitches to practice on and a shower room. They won their all Irelands through practise, practise practise. U17,Minor are development grades, performances are more important that results. U21 and now U20 are adult grades where results are more important and where it is easier to make the step up to senior level. worrying for Mayo take away 2016 U21 success Mayo didn’t even reach the Connacht U21 final in 2010,11,12,13,14,15 and 2017. I hear you Revellino, but I suspect neither did any of the teams Jarlaths beat so it was a relatively level playing field. I’m no expert but i would think nutrition and modern conditioning and recovery off the pitch are huge aspects of sport including Gaa now. U17 players shouldn’t be weight training. Heavy lifting should only be done when the body has matured. Asking the undeveloped frame to carry extra conditioning is the wrong way forward. Young players need to learn to play football and sure, get naturally fit. Bulking up young lads takes away from their speed and natural agility. Get the basics right and when the body has developed, then do as much conditioning as you want, but I would say, that is at the 20 or 21 age bracket. I cannot see how conditioning will help an U17 player. Sure it might bulk him up in the short run and help him bully his U17 opponent but the body will pay the piper in the coming years. It’s the lads who develop naturally that will keep their natural balance and will turn out to be the better footballers in the long run. Now, I’m not saying the Gooch never lifted weights but he sure as hell never bulked up too much in his prime. He was poetry in motion though and always in his prime kept his pace and natural ability to weave his magic. When coming back from injury he decided to use his time to bulk up. Whether it was the bulking up or the inury I don’t know, but when he came back the magic was gone. Alot comment that Connor Loftus is too light and needs to bulk up. More comment that he is a natural talent and would make a grest successor to Andy Moran. Let’s say Connor added a stone and a half in conditioning. Would he still be able to do what he can do now. I’m not so sure. At the senior level I would agree that conditioning is essential for most players or should I say, players who can carry the extra muscle mass (not everyone can). The wizards of the game don’t need it as much. They seem to be able to side step the rough and tumble. Conditioning will undoubtedly beef up an U17 but it won’t improve their abilities with ball in hand. Kerry have won recent minor AI’S because they appointed Jack OC who had senior AI’s under his belt. No doubt they have put some good structures in but I think a manager like that gives them an advantage over all comers. Fair play to Jarlaths, yes practice makes perfect but we all witnessed how clueless minors can be on big days in Croke Park. A team expected to win can bomb. Tyrone played well to beat Dublin and then beaten out the gate by Kerry in last year’s series. Rekon that’s down to big day prep by Jack and Co. Very little clueless running down blind alleys by Kerry and feeding their star forwards good ball. @Shuffydeck Deck, I disagree with your take on Jack O Connor and the recent sustained success of the Kerry minor team.. Kerry have a mine of potential manager’s,.. The don’t always have a mine of super underage player’s.. They have in recent years…. I can’t say definitely that I know why we are so inferior, or so it would seem… Last year in the U17 match, versus Galway the same day our seniors lost, Aaron McHale, a Parke Keelogues Crimlin player, despite being originally picked to play on the programme, only came on when Mayo were well and truly hammered,.. Several Mayo U17 players told me that Aaron was by a mile Mayo’s best player….Look the inclusion of Aaron would not make up the huge gulf in the outcome of the game… But when player’s who are competing for a place with Aaron tell you that I am he should be playing, you know something is seriously wrong!…. I’ve been saying it the past few years but enjoy the current team to the maximum because in a couple years time it won’t be pretty for Mayo in Connacht let alone the entire country. I agree ,mac. At this rate we have about five years before the well runs dry, unless u20 managment can salvage something from the last four years. a real push on the U20 team needs to be made if the schools are doing well they should be competitive. in a way it’s the most important age group for senior. at minor level we have contested one all ireland final 2010-17. 1999-2009 we contested 5 finals. It’s not the lack of success that’s the problem at minor level.Dublin have won only one all Ireland in 34 years,Kerry went 10 years without a title until recently. The problem is the complete collapse in competitiveness . I was in Kiltoom, the difference in size between the two teams before throw in was remarkable. Unfortunately there was a similar difference in skill level also. Our County Chairman spoke about head hunting the manager. But the writing was on the wall for this team when a selector left setup to join U20 setup. One question I have was any of the management team involved in underage football in recent years. I like Tom Morley but surely you need some intrinsic understanding of players before you take over a team. The problems at underage is not because we don’t have a centre of excellence- it’s about having top class coaches and structures. This doesn’t cost a huge amount of money. As someone said above losing is one thing but to be so far behind Galway and Roscommon is frightening. It’s going on a while now too. I wonder have resources that should be going to prepare under age teams been diverted to the senior team in the last few years ? that might explain the dramatic decline. Liam you hit the nail on the head. Smaller clubs in north mayo are on there knees trying to fund raise and the money taken to fund that glorified hay shed. 5 or 6 six clubs calling on the same doors year in year out its very dishearting and wont last. How much did the stand actually cost to build , prices I’ve seen seem absolutely ridiculous. Had they not built the new stand machale pk would now be a kip like Tuam stadium. S&C for underage players is of course beneficial. Recent studies have shown that proper targetted weights and S&C training for U12’s upqards is hugely effective. That doesn’t mean single squats with 60kg on your back but body weight training and free weight training can and does improve core strength (which geeatly reduces hip and knee injuries) and improves flexibility and fundamental movement skills. The work the new development panels are doing will take a couple of years to come through but the numbers are there and thebwill is there and that’s half the battle. In fairness to many of the posters are pointing out key issues that is having impact already or will make ye less competitive going forward. It appears to me that your key decision makers have been blinded by the undoubted success of your senior team which I understand has received significant resourcing over the years nothing like Dublin mind you but ahead of any of the other inter county football senior teams. In fairness they owe ye nothing as have given ye serious value for money but the coaching investment is worrying. Here in Galway we have a well documented financial issue caused by a failed hurling centre of excellence who tried to develop their own after the creation of a football facility in the early noughties which was well planned and all paid for. The output of all this is all codes are now in the original football centre of excellence now called the county centre of excellence but left with a massive debt with the hurling project failure. 100 acres of land bought at the height of the boom worth a fraction in today’s prices. Yet we have developed okay coaching structures from meagre resources so maybe it is as much as getting the right personnel as having significant resources. Still going forward we have concerns as well due to above. In this day and age you need top class facilities to stay at the top. Making do, is alright short term .mayo need both modern structures and infrastructure. KC Fair enough and that story is well documented. I believe that Galway have a more “Get up and go” approach when it comes to organisation. Mayo by comparison are very conservative in their approach and that will not change any time soon. We always made the clubs pay the bill and when the bill grew so did the burden. Galway have huge resources on which to draw from. The county has twice the population and many times the resources so that debt will get sorted. I am less worried about U17 grade to be honest. They are school kids chasing the ball. A couple of inches in height can be a big deal at 16 years of age. Have faith in Tomas and his crew and we will not be too far away. The most important thing with strength training in itself is the need for proper stretching and recovery afterwards. Listen to Lees newstalk interview a couple of months ago where he describes his hip problems stemming from bulking in winter, losing that with football in the summer, but being too shattered to stretch properly in the evenings! Completely understandable, and I’d say it’s the last thing a lot of players would think of doing or would want to do in their down-time (time which is far too limited as it is). Also take the example of Paul O’Connell. While a serious on-field injury ended his wonderful career, he said most of his injuries down through the years resulted from being clumsy in the gym. These are two top, top athletes saying this. Finally, look at our 2013 minors, massive long-term injury issues from overtraining. Strength and conditioning can be a wonderful addition to all ages of athlete, but the most important point from what i can see is that it must be done under proper supervision by knowledgeable personnel, with mobility and flexibility being paramount. Yes PJ cannot disagree with you on that but the internal pull between football and hurling here means in reality we don’t have twice the resources or anything like that given half the county don’t even play football and the demands of two codes. Yes you would think a city would give significant resources but Galway city as many would acknowledge is not a hotbed of GAA and rates worse off than other Irish cities in this regard in terms of player numbers. Roscommon were simply a lot physically stronger last night. If the same two squads meet again at 18, 19 and 20 Roscommon will have less ability to physically dominate each year. Are there two senior footballers in that Mayo u17 squad? There probably will be. Enda Hession kicked his frees last night with both feet. If a Kerry player did that at senior level posters on here would be bending the knee talking about how we wont have players who can do that. But we have the most talented minor free taker since Cillian, frankly a better footballer overall than Cillian at the same age and all we can talk about is how the sky is falling down. Minor has moved on and titles are being won in the weights room. Do we want titles or injury free u20s? We will put together a good u20 team this year. Picked from an injury free panel of u18s/u19s/20s. I believe the best Roscommon u16 last year and u17 this year is actually injured. Thats what a Rossie told me last night anyways. While underage results in recent years have been worrying I think there is an over reaction here. Someone mentioned Kerry minors but Kerry went a long time without winnin a minor and were still producing top class seniors and winning multiple all Ireland’s. I read that Comer couldn’t even make the Jarlaths team. Fact is young lads develop at different stages. It’s about nurturing talent and enabling them to grow rather than the b all of actually winning underage titles.